Currently a part of my daily health regimen are these beauty fruity tropical sweet berry/grape antioxidant nutrients by NeoCell that support healthy hair, lashes, brows, & skin from the inside out :-) A much better alternative to pills in my opinion. They taste kind of like Starbursts, only Acai Berry, a healthier version candy. Being on a strict diet, I look forward to taking them! (Only 20 cals each) They make a good everyday healthy treat/snack throughout the day! They contain no soy, gluten, palm oil or artificial flavors. I have previously tried Biotin in a pill (won't disclose any brand names) & gotten a bad skin reaction and upset stomach but thankfully not with NeoCell! I can get my daily dose with no problem at all - which is important! As far as the aftertaste of the Biotin Bursts, there wasn't any, which I must admit that I was a bit concerned with at first. Each one is individually wrapped in foil, making it easy to take and bring on-the-go. I always look my best when taking them. I do notice the difference when I skip days, so consistency is key when it comes to these, just like with any supplement out there! Like NeoCell's other collagen products (which they are known for), the Biotin chewables helps prevent radical damage, produces/maintains collagen which in turn betters your complexion that is goals! If you have hair fallout/balding/breakage (from an illness like I had) or trying to grow your nails (men or women), maybe try to fill in the nutritional deficiencies, by taking one a day of NeoCell's Biotin to see an improvement. Upping my Biotin intake, worked well for me. Note: Don't expect immediate overnight results. Things take time. A bit of Disclaimer: I am no Doctor. Just giving you my experience. Important to see/talk to your Doctor before use as w/ anything! Artsy well-constructed custom made tea or coffee (or for whatever beverage) cups made by professional artists/designers that are perfect for everyday & special tea parties :-) You can never have too much uplifting/inspirational/statement/motivational/fun quote mugs in my opinion to look at in the morning! It's certainly one good way to brighten up/start your day right & remind yourself that everything's going to be okay! Digibuddha Mugs are high-quality and ceramic with a glaze finish. Also are microwave & dishwasher-safe. They're unique in that they do not have stickers or decals attached like the other mugs out there, which makes them the real deal. You know the graphic print or lettering won't be peeling/coming off anytime soon. DigiBuddha's creative Mugs make a cute long-lasting housewarming gift for loved ones! They're so many different designs and vibrant colors to choose from their collection. Their 'Plant Lady'Mug is by far my favorite to use being that I am a plant lover/vegetarian. Their floral one and "she promised herself better, and she never looked back "are beauties as well! They're currently an addition to my morning tea routine. At first glance, I was surprised at how solid and sturdy all of them were. They're a good size (bigger than I anticipated) and the handle grips easily, which is a plus! Snuggling w/ a blankie and a hot, cozy DigiBuddha mug drink in my hand is the life. Along with the mugs, I received a beautiful artwork! A cute gold metallic on white sheet matte paper 'Bird on a Branch' Foil Art, which was all made by hand! Quite impressive if you ask me! The Gold Foil Art prints are also available in the colors silver or rose gold. Perfect to frame & hang on the wall! Shiny yet adds a fun,minimal touch to any room in the house. I was a little concerned about how it would arrive and if there would be any imperfections but safe to say everything was packaged very securely (in a flat cardboard envelope) & beautifully on time! No bents/scratches/damages, just perfection. I wouldn't say it's a thick poster but it sure makes a good display! Put it in a frame and you're all set. P.S. Mugs can be used as a mini plant pot. Arnica Lotion: Arnica Lotion is 1 of those multi-functional/purpose things I need in my everyday, daily life! Every once in a while, I get leg/joint/muscle pain & it's frustrating because nothing seems to work except for pain-killers :-/ But fully knowing that they're addicting & not good to rely on (long-term), I had to find a much healthier, safer, natural alternative/solution/relief, hence when Arnica Lotion came to my rescue lol! Topical Arnica Lotion like Audel Naturals comes in handy & is a worthy investment! It's quite effective & works pretty fast! Also very soothing, calming, & healing. Even helps with bruises, soreness, swelling, acne, bumps, irritation, inflammation, rashes, circulation, insect bites, back pain, cartilage pain, carpel tunnel, & hair growth! There are no bad chemicals, artificial preservatives, fragrances, colors, gluten, or parabens as everything is organic & cruelty-free :-) The main active quality, skin-loving ingredients are: Arnica, Aloe, Vitamin E, Glucosamine, MSM, Glycerin, Sweet Almond Oil, Green Tea Extract, Grapefruit Seed Extract, Liposome, Safflower Seed Oil - which all help improve my skin while moisturizing it at the same time! What can't Arnica do? Will def. be adding to my self-care & first-aid kit. Fun fact: Did you know that Arnica was used for traditional medicinal purposes in the past (1500s)? Important note: Contact your health care provider prior to use! Con: Using too much can be toxic & completely do the opposite. Only a small amount is needed! 100% Pure Peppermint Oil: Another must-have for everyday emergencies! Like lavender, peppermint is my go-to flavor. It's minty-fresh, cooling, clean, uplifting/therapeutic, & anti-bacterial/fungal/parasitic. With that said, I am trying to incorporate it more into my home-cleaning, beauty & health care routine. Also can be added to a humidifier, diffuser, air-freshener, & facial steamer. It's a natural household cleaner without the harmful chemicals. Lasts quite a while as a few drops goes a long way. There are just so many uses & benefits to peppermint! Just like Arnica Lotion, Peppermint Oil goes way back and has a history of medicinal uses. It helps w/ stress, tummy/digestive issues, congestion, muscle soreness, headaches, sore throats, fevers, colds/coughs, flu, constipation/IBS (Irritable Bowel Syndrome), bad breath, hair loss, respiratory problems, heart burn, acne, inflammation, itchiness, & low energy! All-in-one. I like to carry Audel's Peppermint Oil around my purse! You can use it topically or orally but warning: it is strong/concentrated, so consult with health care provider beforehand! Peppermint Oil like Audel's even keeps pests away. A staple in my medicine cabinet for sure! 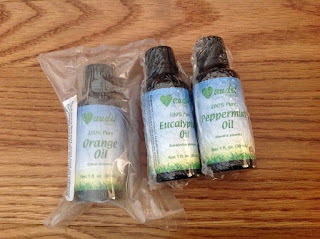 Orange Oil (for topical use): Another natural pain relief oil w/ lots of benefits! Audel's Orange Oil (AKA natural anti-depressant) has a citrusy, energizing aroma & is high in Vitamin C. It helps build collagen & improves blood flow! Again, just like the essential oils above, it's anti-inflammatory/septic/bacterial, mood lifting, and good for the immune system! A natural solution to infections, cold, allergies, coughs, E. coli bacteria prevention, headaches/fatigue, injuries, acne, redness/swelling, gum problems, arthritis, muscle spasms/cramps/sprains, indigestion, constipation, high blood pressure, fighting tumors/cancer, abdominal pain & more. When I get angry or anxious, I know this will help me big time as it's an instant pick-me-up! As for hormonal breakouts & acne marks, Orange Oil is a natural healing acne treatment that can help keep them away! It's one product that skin care routine has been missing. Just a few drops (2-3) mixed with a cup of water and I have my own natural face wash. It can also work as a good massage oil on the face, neck, & body (as it's a circulation booster), facial mask (mixed w/ honey), air-freshener (along w/ water in a spirtz bottle), kitchen cleaner (added in spirtz spray bottle along w/ water & other oils) as it has a very clean scent. I'm looking forward to using it in the mornings to calm my nerves & brighten up my mood. Pretty much goes well w/ any other oil! -May not suit sensitive skin. Should do a skin test beforehand! -Interacts w/ other medications. Must consult w/ a Doctor/Health care provider prior to use! Disclaimer: I am not a certified professional nor Doctor. The information on my site is not meant to prevent, cure, treat or diagnose any disease or health condition. I am just sharing my experience with Audel Naturals essential oils. Never use essential oils undiluted unless advised by your Health careprovider or certified aromatherapist! I will not be responsible for medical injuries or anything that happens to you when you use these essential oils. You must seek your Doctor or Health care provider's advice/permission prior to use! (especially if you're pregnant, nursing, breastfeeding, have allergies or sensitive skin, around babies/children, pets or taking any medications). Visitors from EU may do so at their own risk. The administrator will NOT be responsible for any instances that may be considered violation of GDPR. With Spring, comes rainy/gloomy/stormy days and I could sure use a good black umbrella like Veckle's that is easy to use & functions properly unlike the other easily broken ones that I used to own! Veckle's umbrella is windproof, water-proof, classic/sophisticated-looking, and can match pretty much anything I wear. It has Teflon coating and pongee fabric - both good quality, strong material! With a touch of a button, it can open/close automatically. A very useful/convenient, interesting and easy-to-use product! My favorite features about this umbrella is the non-slip grip handle, safe lock design and fluorescent/reflective lining, which will come in handy for travels, going to work, & dark evening/night walks. Plus, it is large enough to keep me & everything I'm carrying dry. A reliable umbrella likes this one makes it much easier to run errands or go to work on wet days. Sometimes, I like to keep mine in the glove compartment just incase of unexpected wind & downpours! All in all, certainly a useful gift for a man, kid, or woman in your life! If you don't live in a sunny climate, this is a must-have/staple! We tend to forget until the very last minute just how important a functional, sturdy umbrella really is, so to me, it's definitely worth the splurge/investment! Yay to no more getting stucked/soaked in the process of closing an umbrella anymore :-) This solves the problems. Every now & then, I like to pamper myself and try out new vegan & cruelty-free hair care products, so I decided to give Hair Phix Hair Masque a go! It's an at-home hair treatment that contains the key good ingredients: essential fatty acids, amino acids, essential oils & 100% organic GMO-free plant stem cells! All helps to repair scalp cell damage (from the plant stem cells), strengthen, hydrate & soften damaged hair from hot tools, chemicals from products/treatments as well as environmental factors! Hair Phix Hair Masque smells fresh and fruity (like a mix of avocado, coconut & kiwi to be specific). It has an oily yet creamy-like thick consistency - perfect for thick long hair folks like myself. It gets in there deep. My hair felt instantly soft, smooth & moisturized after use. Also aids in detangling! (so there's really no need to comb or brush your hair in the shower) It clearly does the job and feels good on! Since using it, I have noticed an improvement in the condition of my hair! It looks kind of more shiny/glossy and makes my hair color pop. Results were beautiful! All in all, a good easy-to-use conditioning product or deep treatment that lasts quite a while! Leave it on for a while & then rinse, or just apply to hair, cover w/ a hat or cap and go to bed like I did. It certainly is 1 home remedy for damaged hair as knots come out & is easier to manage. Bright Zeal's unique LED lighting products are quick & easy to assemble! Both the 'LOVE' & heart signs from this company comes with 2 AA batteries, on/off switch, 6 hr timer & keyhole slot/hook hole on the back to hang up on your wall. They certainly add warmth to living spaces & makes you feel cozied up. My favorite thing about them are that they are energy-efficient & automatic. The lights stay on for 6 hrs, shut off for 18 hrs but then turn on again for 6 hrs & repeats! They're good for the climate/environment! I chose both (the 'LOVE' & heart sign) in the white finish design. I feel like you can't go wrong with white. It's a good color option when it comes to home decor & so is the color black! Another thing I like about Bright Zeal's products are that their LED bulbs do not burn, but rather stay cool - unlike the other bulbs out there. Though, important to note that these bulbs be handled w/ care! They consume far less energy than incandescent bulbs, which is a big plus! & there's no need to worry about outlets or dealing w/ messy wires. As for the tall candle lantern, it's a more rustic/vintage/antique/wood/edgy piece. It's sturdy, automatic, energy-saving & wireless. Perfect for a fall night & almost any occasion - indoors or outdoors! It looks gorgeous on the tabletop or hanging wherever you please! Just like the LED lighting signs, it comes with batteries (3 AAA) & on/off timer that lights for 6 hrs, turns off for 18 hrs but then turns back on again for another 6 hrs). What makes this candle lantern unique is not only the cross-cross design & top ring but that it is flameless, smoke-free, & BPA free - making it safe to use basically anywhere (around animals & kids). I'm all about safety 1st, so this product does meet my standards. There's less worries, mess & anxiety for me. The candle is also housed in glass and looks like a real candle. All in all, Zeal Lights truly makes everything fun & simple! It creates a soothing, cozy and relaxing environment that is instantly comforting without any risk of fire. Minimalistic products that fit my lifestyle & add a unique touch! All items were well packaged & true to photos!